The 2017 Jeep Wrangler is a legendary SUV that delivers best-in-class off-road performance, high-tech infotainment features, and impressive passenger comfort. The Wrangler also offers the safety gear you need to keep your favorite passengers protected. When it’s time to travel over rough terrain, there’s no better companion than the Wrangler. 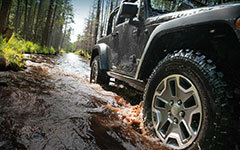 Back on the pavement, the latest Jeep Wrangler also supplies a confident, composed ride. Inside, passengers enjoy impressive support and modern comfort features. The 2017 Jeep Wrangler’s unbeatable performance begins with its 3.6-liter V6 engine. It supplies 285 horsepower and 260 pound-feet of torque for extreme performance, on-road and off. All Wranglers come standard with four-wheel drive for maximum traction on any surface. Switch between high- and low-range gearing for enhanced performance in a number of different settings. In addition to substantial off-road performance, the 2017 Wrangler offers speedy acceleration. Properly equipped, the Wrangler can tow max loads of 2,000 pounds. Because the Jeep Wrangler is so unique, it provides a range of features that you simply won’t find in any other vehicle. 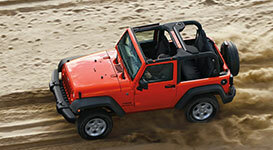 For example, you can remove the Wrangler’s top, doors, and windshield for an excellent outdoor adventure. Off-road-ready gear, like skid plates and tow hooks, help you ease down rugged trails without a hitch. If you already know you’ll need them, you can choose specialized mud terrain tires. This icon of the off-road also serves as an upscale people-hauler. Luxury features – such as leather upholstery and heated seats – balance the Wrangler’s rough exterior style with upscale comfort. Both rows of seating provide ample head-, leg-, and elbowroom, making the Wrangler a great pick for your next cross-country road trip. 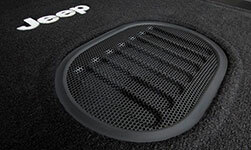 In addition to endless comfort, the Wrangler is big on modern technology. The central Uconnect infotainment system offers everything you need to stay connected on the go. Use it to send hands-free text messages or stream your favorite playlists from devices. Plug your laptop into the 115-volt power outlet and play your favorite computer games on the road. The 2017 Jeep Wrangler safety lineup is designed to impress. The Insurance Institute for Highway Safety gave the Wrangler its top score of “Good.” The Wrangler’s antilock brakes provide impressive stopping power when you need it most. A variety of airbags, including front side airbags, mitigate passenger injury during a collision. Traction and stability control helps you maintain authority over your ride, even in rough weather. When it comes to rugged appeal, there’s no finer choice than the Wrangler Rubicon. This SUV is ready for absolutely anything, thanks to exclusive off-road gear like rock rails and the electronically disconnecting front sway bar. The Rubicon also provides a shorter 4.10 axle gear ratio for world-class performance over rugged terrain. The electronic front and rear locking differentials help you navigate tough spots with the utmost care. Infotainment apps and smartphone integration technology keeps you connected. Enjoy first-rate audio, no how far you wander from the pavement. Remove the Wrangler’s top, doors, and windshield for a true outdoor adventure. When it comes to rugged performance, nothing beats the Jeep Wrangler. If you’re looking for a rugged-yet-modern ride, look no further than the 2017 Jeep Wrangler. This iconic SUV is all about power and performance, with loads of specialty gear designed to help you traverse sand, snow, and rocky terrain. Inside, you’ll find impressive passenger comfort and support. Attractive features, like leather upholstery and the Uconnect infotainment system, make you feel at home throughout your travels. The Wrangler’s safety gear protects you in a pinch.